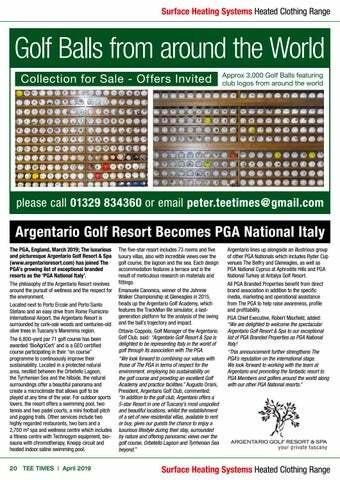 Argentario Golf Resort Becomes PGA National Italy The PGA, England, March 2019; The luxurious and picturesque Argentario Golf Resort & Spa (www.argentarioresort.com) has joined The PGA’s growing list of exceptional branded resorts as the ‘PGA National Italy’. The philosophy of the Argentario Resort revolves around the pursuit of wellness and the respect for the environment. Located next to Porto Ercole and Porto Santo Stefano and an easy drive from Rome Fiumicino International Airport, the Argentario Resort is surrounded by cork-oak woods and centuries-old olive trees in Tuscany’s Maremma region. The 6,800-yard par 71 golf course has been awarded ‘BioAgriCert’ and is a GEO certified course participating in their “on course” programme to continuously improve their sustainability. Located in a protected natural area, nestled between the Orbetello Lagoon, the Tyrrhenian Sea and the hillside, the natural surroundings offer a beautiful panorama and create a microclimate that allows golf to be played at any time of the year. For outdoor sports lovers, the resort offers a swimming pool, two tennis and two padel courts, a mini football pitch and jogging trails. Other services include two highly regarded restaurants, two bars and a 2,700 m² spa and wellness centre which includes a fitness centre with Technogym equipment, biosauna with chromotherapy, Kneipp circuit and heated indoor saline swimming pool.